Gunyah artists-in-residence program provides low cost self-contained accommodation for solo, collaboration, group and family short term creative residencies for visual artists, writers, composers, designers, curators, new media and performance artists. 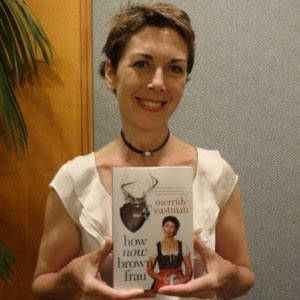 Merridy Eastman is a best selling author, actress and mum who lives in Sydney. Since graduating as an actress from NIDA in 1983, she's worked mainly on stage for the Melbourne Theatre Company, the Sydney Theatre Company and the State Theatre Company of SA; as well on television as a presenter Playschool for five years, and regular cast member on Always Greener and Packed to the Rafters. Merridy says that although she still loves the acting work, she's happiest of all when writing, perhaps because her school librarian mum filled their house with books. In 2002 Merridy wrote her first book called There’s A Bear In There, And He Wants Swedish. This was followed in 2007 by Ridiculous Expectations and How Now Brown Frau in 2011 about her five years living in Bavaria. All three books were published by Allen & Unwin and one was a best seller. 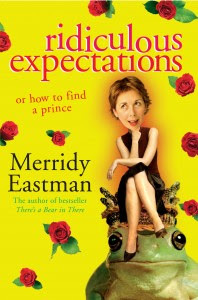 Merridy has also been commissioned to write short stories for Penguin and Pan Macmillan anthologies, as well as short theatre pieces and have worked as a script editor on television scripts. During my residency at Gunyah I plan to continue writing “I Knew We Weren’t Spanish”, which began in 2014 after discovering that my father’s family wasn’t Spanish at all, but Aboriginal, and that my great great grandfather, John Jonas, wasn’t a toreador so much as a Worimi man from the Paterson River. This discovery came about when my cousin, Dr Bill Jonas (who was Race Discrimination Commissioner with the Australian Human Rights Commission, as well as Aboriginal and Torres Strait Islander Social Justice Commissioner) introduced himself and told me about this extraordinary history we share. I was fascinated that my father’s family and generation had so swiftly swept our ancestry under the carpet, whispering the awful phrase, 'a touch of the tar', whereas my generation (me, my siblings and cousins) celebrate the same discovery with a sense of pride and an insatiable hunger to know more. I plan to continue sorting through the historical research I’ve accumulated over the last two years, and finish the first draft of my fourth book in the peaceful surroundings of Gunyah, and in Worimi country, so relevant to my story. 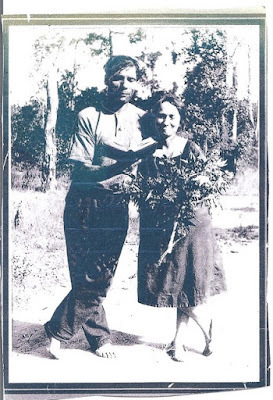 “I Knew We Weren’t Spanish” follows the story of the Jonas family who settled in Allworth, half an hour’s drive from Gunyah, a beautiful place on the Karuah River, where we stayed with my grandparents every school holiday. It begins at a time so perilous for Aborigines in the Hunter Region; and tells the story of a Worimi man, his two consecutive marriages to white women in the late 1800’s; the less happy story of his first child, my great grandmother Rose, who married my great grandfather (just released from Darlinghurst Gaol for the attempted murder of his ex); Rose’s famous buckjumping step brother Billy Jonas who (with Ned Kelly’s nephew Ned Lloyd) was shipped off to London to perform for George V’s coronation in 1911, and on it goes. 'Gunyah' means resting place or place of shelter in the Gathang / Kattang language of the Worimi people in the North Arm Cove area, and the term also features in a number of other Indigenous languages in NSW . . . 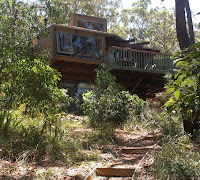 This timber pole house, named Gunyah, was designed and built in the early 1980s by a group of friends who continue to enjoy holidays here, as well as inviting artists to spend time in this special place via the Gunyah artists-in-residence program. "Gunyah artists-in-residence program acknowledges and pays respect to the Worimi people - the traditional custodians of this land - to their elders past, present and emerging, it is on their ancestral lands that the Gunyah artist-in-residence program is located." "Gunyah artists-in-residence program acknowledges and pays respect to the Wormi people - the traditional custodians of this land - to their elders past, present and emerging, it is on their ancestral lands that the Gunyah artist-in-residence program is located."